This information is of tremendous importance. 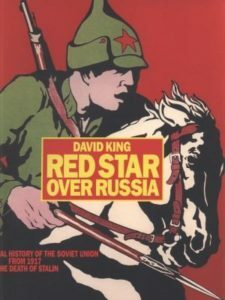 Red Star Over Russia is one of the best English-language overviews of the birth and early decades of the Soviet Union. This is primarily a collection of visual materials, presented in large format with high-quality printing/reproduction. There are extensive annotations to contextualize the images, which increases the value of the book tremendously. This is really an essential collection. It is a very nearly necessary supplement to written histories and biographies of the era in question. For instance, the war photographs from the Great Patriotic War (WWII) are quite indescribable, and are, alone, the sorts of things every human being should be exposed to as part of a historical education. There are, however, a few things to note about this book. King is a Trotskyist. So there is a disproportionate amount of material on Lev (Leon) Trotsky, and essentially no criticisms of Trotsky (such as of his well-documented arrogance). There is also a staunchly anti-Stalinist perspective. While documenting Stalin’s crimes is necessary, readers should be aware that the book is tilted against Stalin (and others) in a typical Troskyist way — without, say, the acknowledgment that many Troskytists have made in recent years that elements of Stalinism were inevitable in the USSR or recognizing some of Stalin’s achievements. Anyway, as a book that focuses on visual art, with tangential discussions of the text on propaganda posters and such, readers will have to look elsewhere to lean more about the music and writing over the early Soviet era — like the great writers Andrei Platonov and Mikhail Bulgakov. Moreover, there are a few misleading comments in the book. Take for instance an indication on page 308 that TASS window posters were “hand-painted”. As detailed in Windows on the War, the TASS news agency did release a few window paintings that were free-hand painted on easel, in the manner King implies, but they were very limited in number. More common were (small-scale) reproduced stenciled posters with painterly effects (what today might be called “artisinal” in the West). Although maquettes may have been initially hand-painted, these stencil posters were not free-hand painted. The images on pages 308 and 309 of King’s book are stenciled reproductions (evident by the individual sheets glued together to form the overall image). The criticisms of this book are all ultimately minor. King’s Trotskyist slant should, however, be noted by readers. Yet King certainly does not hide his outlook, which is commendable. Everyone has an outlook — there is no such thing as “objectivity” in these matters. To the extent that Knight (or others) are insisting that Chomsky (or others) assume the position of a Hegelian “beautiful soul” I disagree. Other other hand, from sort of a Bourdieu (or Bachelard) sort of sociological perspective, it is crucial to understand the institutional field in which a “major” academic like Chomsky operates. I think Knight is more concerned with how Chomsky is or isn’t a “useful idiot” for military interests like Robert Oppenheimer with the Manhattan Project.